Mars Creek within the campus of Macquarie University is undergoing a facelift. The Reach 1 works, designed by Storm, have created one of the most impressive creek projects in Australia. Stormwater NSW picked a fantastic, warm day to host the most recent NSW technical tour themed “What’s Hot and what’s not in WSUD”. Run on the autumn equinox (Mar 21), this tour travelled across the north shore and northern beaches of Sydney. Stop No.1 was Macquarie University which boasts a range of cutting edge WSUD projects. The Uni campus is experiencing significant growth in buildings and facilities, and sustainability is integrated into the planning and design. 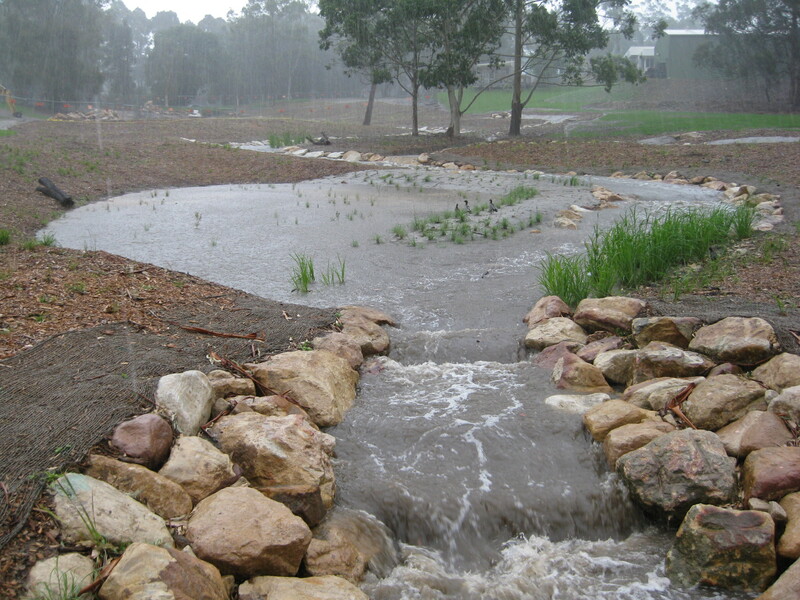 Over the 250m long Reach 1, a new creek channel has been created with pools, riffles, planted benches, a cascade, on-line pond. Blended into the design is an upstream GPT and treatment wetland, a backswamp floodplain wetland which is activated in higher flows, and WSUD channels that convey stormwater from existing pipe outlets into the creek system. Landscaping including planting, paths and a bridge crossing complete the reach.